I have a LOT to speak of today – culminating in something I should have memorialized years ago, amidst my heyday of publishing “primers” of the gold Cartel’s myriad, day-to-day operations. I’m having trouble choosing which “PM bearish, everything-else-bullish” topic to start with – but due to how smothering the never-ending “Russian hacking scandal” has been – spearheaded by CNN, “America’s least trusted media outlet”; and the fact that started watching the incredible USA Network Series, Mr. Robot; I’m commencing with an item I’m sure will get little press – other than on Zero Hedge, where I found it – but has a LOT of relevance to the world’s future path. Which is, the arrest of two hackers for breaking into thousands of Italian email accounts – including ECB Chairman Mario Draghi’s, and soon-to-resign Prime Minister Matteo Renzi’s. Quite obviously, the age of exponential technological advancement is upon us – like this month’s unveiling of Google’s “driverless cars”; to the point that not only will our lives dramatically change, but the means of them being violated will increase equally dramatically. Which in most cases, is a bad thing – but as WikiLeaks, Anonymous, and others have taught us, can also be an extremely powerful societal ally. The emails and chat messages between Deutsche Bank and its PM-smashing “allies” – which are now public record; or the smoking gun revelations of collusion between the UK and U.S. governments to create the COMEX itself, solely for the purpose of suppressing Precious Metals. In other words, the powers that be’s’ long-standing secrecy is being compromised; and with each new revelation, more and more people will realize they have been duped, defrauded, and/or propagandized – resulting in actions that will inevitably undermine such schemes – like the past two years’ anti-establishment elections; and, inevitably, the overwhelming of rigged markets like stocks, bonds, currencies, and Precious Metals. Speaking of currencies, seemingly each day a new one is crashing – like today, when the Venezuelan Bolivar, Turkish Lira, and Mexican Peso are hitting new all-time lows. And how about the Chinese Yuan; which, after its biggest ever one-day surge ever, of roughly 2% (amidst the PBOC’s largest-ever intervention); has lost more than half of its ill-begotten gains in less than a week – to the point that, now that the round number of 6.9/dollar has been recaptured by Yuan bears, the all-important 7.0/dollar level is once again looming. I.e., the point that the real speculation of just how low it can go will commence. And now that the entire investment world realizes just how tenuous the PBOC’s finances have become – care of the exploding capital outflow data that are blatantly understated; and irrespective, catalyzed dramatic capital controls’ it mayn’t be long before, as I predicted last week, the “cataclysmic financial big bang to end all big bangs – i.e., a significant Yuan devaluation – cascades over the drunken “Trump-flation” crowd, like a massive deflationary wave. Not to mention, the cantankerous geopolitical age it will usher in, as the “final currency war” goes thermonuclear. This, as China’s chief trading partner – and economic competitor – the U.S., inaugurates the most protectionist-leaning President in decades, if not centuries. As I assure you, the U.S. response – and Chinese counter-responses – could be extremely deleterious to global economic activity, financial asset valuations, and foreign exchange stability. And it’s not just China, but all American trading partners – starting with Mexico and Japan, whose automakers are under siege by Trump before he’s even inaugurated. To that end, it was two years ago when I deemed the type of violent currency instability we are seeing today; which, if the Yuan is significantly devalued, will increase dramatically; the “single most Precious Metal bullish factor imaginable.” This, before I even conceived that a significant Yuan devaluation – or a vehemently anti-globalist U.S. President – was possible. Or, for that matter, a virally spreading “war on cash” – which may well, as soon as 12 months from now, envelop significant amounts of the “civilized” Western world. Next up, the mirage of “recovery” the paradoxical “Trump-flation” meme has temporarily inspired – as evidenced by surging consumer and business “confidence,” despite abysmal real metrics like sales, production, earnings, and tax receipts. Ironically, much of said “confidence” resulted from the one-time, nearly $500 billion pre-election, debt-financed spending spree the Obama Administration went on this Fall, in an ultimately failed attempt to secure a Hillary Clinton presidency. That said, recent economic data clearly shows said “boost” is already wearing off as we head into 2017 – when a broad swath of recessionary waves will lambast America like a tsunami. Heck, not only was last week’s December NFP “jobs” report a disaster on the surface, but even the Wall Street spin that “wage growth” saved the day is being refuted; not to mention, as just one day later – i.e., yesterday – the Fed’s own Labor Market Conditions Index not only contracted, but depicted its largest year-over-year decline since 2010! When I called the top in interest rates in early 2014’s “3.0%, ‘nuff said” and “2.6%, ‘nuff said,” the U.S. economic situation was far stronger than it is today, irrespective of the “bond vigilantes” having finally awoken after interest rates – both here and abroad – were driven by Central banks to their lowest-ever levels. I mean, with each passing day of economic data weakness – such as the first year-over-year automobile sales decline since 2009, and massive numbers of scheduled retail store closings; the fallacious meme that interest rates will rise due to a “strengthening economy” holds less and less water. Which is probably why the money markets anticipate just two rates hikes this year (I assume zero), versus the Fed’s vehement prediction of three; whilst Precious Metal prices are inexorably rising. And equally probably, why the bellwether ten-year Treasury yield may well have topped not at 3.0%; or even 2.6%; but instead, the key round number of 2.5%! Regarding such anti-economic “waves,” let’s start with the giant pink elephant in the room that is surging Obamacare premiums; which even Trump knows have no chance of being “repealed and replaced” any time soon; which are DESTROYING the finances of millions of U.S. households. And how about the new Social Security Tax that came into effect yesterday, that hasn’t been covered anywhere but in Zero Hedge? Let alone, surging gasoline prices, care of the faux OPEC agreement – even if such gains have been muted so far, given the massive glut in the physical markets that grows larger with each passing day – no matter how much paper markets are goosed by “oil PPT” futures buying, and fraudulent “production cut” propaganda. Yesterday’s news that the U.S. government will be selling eight million barrels from its Strategic Petroleum Reserve; given that – like China’s – it is massively larger than necessary; as clearly, the U.S. government has been “borrowing and spending” on crude oil to prop up prices, given the hundreds of E&P bankruptcies that would result from sub-$40/bbl prices. This, as it’s become common knowledge that China, too, has essentially filled its SPR – to the point that a potentially major source of – arguably artificial – demand may well morph into a very real source of incremental supply, at a time when OPEC/NOPEC is desperately trying to portray a market moving towards supply/demand “balance.” LOL, amidst an environment of record inventories; flattening demand; a multi-year high dollar; and heightened global energy conservation. 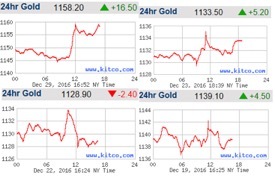 Which brings me to today’s topic – the 12:00 PM EST “cap of last resort” tactic the Cartel has been using, for years, to cap and/or attack nearly all Precious Metal rallies that continue past 10:00 AM EST; i.e., “key attack time #1,” representing the global close of physical gold and silver trading. Frankly, I’m not sure why I never wrote a dedicated piece regarding this most blatant – and demoralizing – of all Cartel algorithms; given that, in the polar opposite fashion of the “hail mary” algo that props up the “Dow Jones Propaganda Average” nearly every afternoon, the “COLR” algo starts the process of walking down (and in many cases, smashing away) Precious Metal gains, to prevent “undue” exuberance that might 1) generate strong daily gains, and/or 2) create “undue” momentum heading into the following trading day. That said, given the heinous price-capping we have witnessed essentially every day since the powers that be went all-in goosing stocks and suppressing PMs after the election, I felt it was time to add another installment to my ongoing series of “manipulation primers”; going all the way back to the four I published in 2010, before I started at Miles Franklin, comprising more than 700 cumulative pages. Since joining Miles Franklin in 2011, I’ve penned the following; each with the goal of exposing the fraudulent PM paper markets, with the overarching goal of – along with GATA and a handful of other manipulation fighters – spreading said truth virally, so that millions; and hopefully, billions; will one day act to overwhelm it. As for the 12:00 PM EST “cap of last resort,” it couldn’t be easier to explain. In fact, here it is yesterday; in silver’s case, at exactly 12:00 PM EST, kicked off by the aforementioned “Cartel Herald” algorithm; and in gold’s, roughly 45 minutes later. Again, it doesn’t have to be on up days – as plenty of times, big down moves commence at 12:00. However, for the most part it is used precisely as the name suggests; i.e., to make sure any “undue” price rises – such as those above the Cartel’s primary daily “upside limit” of 1.0% – are controlled and/or reversed. 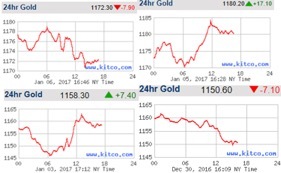 Here are charts of just a sampling of trading activity in the past three weeks – encompassing nearly every trading day; amidst an extremely bullish phase, in which gold prices may well have bottomed. During which, quite blatantly, the “COLR” algo was utilized – invariably, coupled with the “Cartel Herald” – to stop all PM rallies cold. In fact, some of the charts appear so similar – like December 29th, January 3rd, January 5th, and January 9th – you’d swear they were the same day, if you didn’t read the dates. Which, by the way, is exactly how you’d view the majority of “Dow Jones Propaganda Average” charts, “influenced” by the dead ringer, variations, thereof, and hail mary algos essentially every day. P.S. I kid you not, it’s 12:00 PM EST as I’m about to hit “submit,” and would you like to see what the gold price is doing – with no other market materially budging? I mean, you just can’t make this stuff up! Andy- Thank you as you give us proof again that it’s a great time to pick up and set aside some Cartel subsidized wealth “insurance” – not to be confused with “investing”.